As many of you know, November is World Quality Month. Last month, I wrote about upcoming events and celebrations in honor of this event. As expected, there’s even more going on this month. 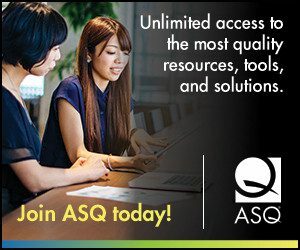 See worldqualitymonth.org for all the details. So in November, I ask the Influential Voices and other readers to share a “quality moment.” It can be an experience at work where you improved something or solved a problem. Or maybe your quality moment occurred outside of work. Did you share your quality moment with your colleagues? Was it part of a bigger solution? Did it give you a sense professional satisfaction? Either way, I’d like to hear about it. And by the way, if you like ASQ’s popular Quality Quote, you can create your own via the Quote Generator. I know, I know, Deming was no fan of slogans. Yet we all have words—hopefully not exhortations—to live by. Share yours.